Springtime has finally arrived along with warmer weather. 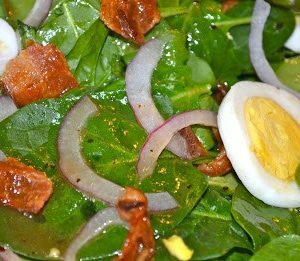 Those two things make me think of cooking outdoors and fresh salads. 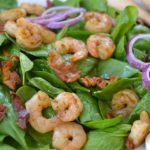 With those thoughts in mind, I combined several delicious ingredients that my family loves – grilled shrimp, bacon, and spinach. I turned these three into a wonderful salad that makes a complete meal. Just add a little crusty bread and you are done! 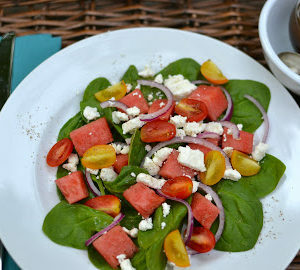 Combine outdoor cooking with fresh flavors and you get this tasty salad. Place grill pan on grill and set burners to high. Sprinkle shrimp with Old Bay seasoning and toss to coat. Place shrimp on grill pan. Grill shrimp 2-3 minutes per side. They will be firm and white when fully cooked-check often, being careful not to overcook. In a small bowl, mix vinegar, sugar, honey and mustard. Heat bacon drippings in pan on low. When drippings are warm, slowly pour in the vinegar mixture. Whisk all ingredients together until mixed well. 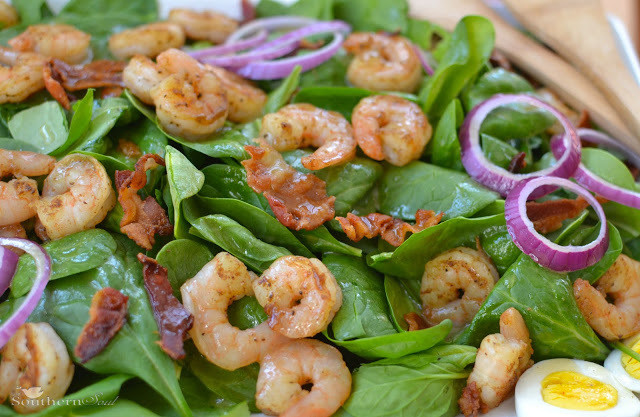 Arrange shrimp,crumbled bacon and onion on top of greens. Gently drizzle with warm dressing. 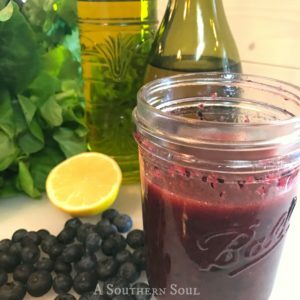 PreviousCheck Me Out Today on Southern Bite!